One of my friends recently mentioned that there is this place called Tanjung Agas jetty which is located about 25km south of Port Dickson is a favorite angling spot among the locals. Although I haven’t been to this place, the information about this place extracted from this friend of mine is quite comprehensive. The place is actually a jetty over Sungai Timun where it joins the Strait of Malacca. There are a mix of fresh water and salt water fishes here for you to fish. 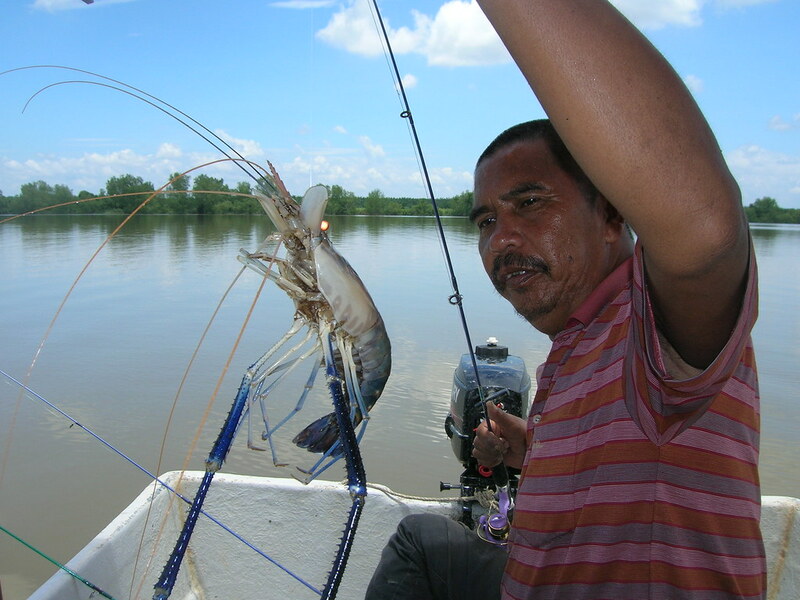 Anglers who love udang galah (giant fresh water prawns) will find this place a heaven because Sungai Timun is famous for udang galah or tiger prawn. This is a typical tiger prawn. It's freaking huge! The good thing about this place is part of the wooden walkway along the jetty is actually covered and this provides some shelters for anglers when the afternoon sun becomes too hot. I am not sure what the extend of the shelter is, but at least it’s good to know that there are something that covers you from the scorching afternoon sun. There are a few restaurants behind the jetty where you can bring your catches to either to let them make a great meal out of it or cash in on it. Apart from fishing, visitors can go for a cruise on the river. But beware of crocodiles in the river! My advise is don’t dive or go for a swim. During night time, according to some locals, there are some stretches along the river where you can watch fireflies. When you are there, do ask around and you might be able to catch this wonderful view at night. Although I am not a big fan of fishing, I would certainly go to this place for a visit when I ever step foot on Port Dickson. Wet World Pedas Hot Springs – The hot springs, about 15km from Seremban, is a delightful retreat for the whole family. Its two open-air pools are popular with adults and children. Attractions include underwater reflexology footpath, twin slides, wave pool and wading pool provide splashing fun for all. Lata Kijang Waterfalls – This is one of the highest single drop waterfalls in Malaysia. Situated deep in the jungle in the district of Jelebu, it is accessible by four-wheel drive. The two-hour trip through rugged terrain, traversing Orang Asli or aboriginal settlements and a plethora of wild plants, rewards visitors with the breathtaking sight of this waterfall. Ostrich Farms – Drop by the Jelita Ostrich Farm in Seremban or the PD Ostrich Farm in Port Dickson to take a close look at these huge birds. Enjoy feeding the ostriches or watch other animals such as turkeys, rabbits and horses. Port Dickson – The coastal resort of Port Dickson or PD is a popular weekend retreat on Peninsular Malaysia’s southwestern coast. Its sunny beaches, lined by tall coconut trees and shady casuarinas, are perfect for a short beach holiday. There are numerous locations here for family outings and picnics. Its famous beaches, Teluk Kemang and Blue Lagoon, abound with water sports and beach activities. Ulu Bendul Recreational Forest – This recreational forest is ideal for activities such as mountain climbing, jungle trekking, camping and picnics. Its verdant greenery and clear river water make it a favorite weekend retreat. The Majestic Malacca Hotel – The Majestic Malacca is a boutique hotel where modern comforts and the charms of Malacca’s bygone era come together beautifully. If buildings could talk, YTL Hotels’ The Majestic Malacca (TMM) would surely have a few stories to tell. Pangkor Island – This popular island offers visitors the unique opportunity to live near fisher folk and observe their lifestyle, savor seafood delicacies, or simply enjoy the sun, sea and sand at numerous beaches along its beautiful coastlines. Located nearby is the exclusive Pangkor Laut Island, noted for its world-renowned resort.